Highly romanticised American biopic of martial arts icon Bruce Lee, grossly inaccurate and overly sentimental but also highly engaging, packed to the brim with Lee-like kung fu fighting. Released to coincide with the twentieth anniversary of his death, the film offers the uninitiated a window – if a little frosted – into the life and times of the fallen star. Hawaiian actor Jason Scott Lee plays the Little Dragon from his formative years in Hong Kong to his student days in Seattle, where he meets and marries Linda (Holly) and tries with muted success to make it in Hollywood as a film star. Lee returns to Hong Kong to achieve groundbreaking success in movies like The Big Boss and Enter the Dragon, before dying young from a brain hemorrhage. The main delight is Jason Scott Lee. He is superbly cast as the martial arts star complete with accurate impressions of Lee’s delivery and mannerisms. 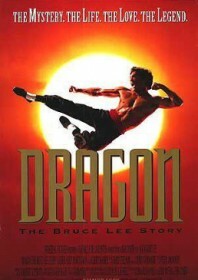 Intriguingly the role had been offered to Bruce Lee’s son, Brandon, who wisely declined any involvement. The action scenes are particularly good, performed well and with a great intensity. But there is one major snag: a convoluted and tedious supernatural subplot in which Lee confronts a medieval demon in an attempt to stop the metaphysical curse from passing on to his son. The cruel irony being that shortly before the release of the film, Brandon Lee would die from bullet wounds on the set of his breakthrough film The Crow. Dragon is a slick popcorn drama offering accessible excitement for people whose knowledge of Bruce Lee is limited to rumours and movie posters. Although it might not necessarily expand on this knowledge, it is stirring enough to act as a cornerstone to explore the real man and his beliefs.